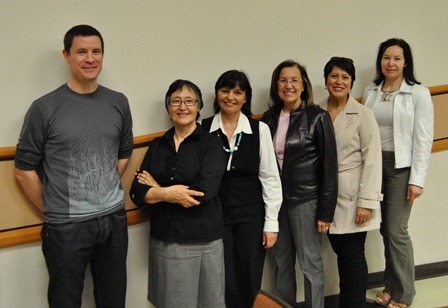 In 2011, the wāskamisiwin staff and faculty development series was created through collaboration among the Gwenna Moss Centre and the Colleges of Education, Nursing and Medicine. The goals of this series contribute directly to the University’s commitment to Aboriginal Engagement, and include generating increased awareness of the historical roots of contemporary social relations, considering the implications this history has for pedagogies being utilized within academic institutions, and fostering more positive and respectful relationships among Indigenous and non-Indigenous peoples. Last year’s series consisted of six presentations on topics such as Circle teachings, Indigenous health and well-being, the Plains Cree way of life, the Indian Act and residential schools, anti-racist education, and Indigenous pedagogy. This year the series has been expanded to include additional presentations on cultural protocols, cultural safety, and decolonization. wāskamisiwin is a Plains Cree term that refers to ‘growing in awareness’ (the absence of capitalization is a feature of written Plains Cree). It is not a commonly used term among Cree-speakers, and in discussing its meaning with local Elders and knowledge keepers we discovered that the root word refers to the process of ‘regaining one’s right mind,’ or, more simply, ‘sobering up.’ We hesitated about using this term to describe our program but in the end decided to keep it. In our case, ‘sobering up’ refers to regaining our ‘right minds’ through decolonization—challenging and re-writing the colonial narratives of dominance, oppression and exclusivity that have severely impacted the lives of Indigenous and non-Indigenous peoples in Canada. For more information about the wāskamisiwin series, please see the Website.